Used For: The remedy is used to promote expectoration, and cure diarrhea. Bear’s garlic is popularly used for atherosclerosis, even its severe cases, and liver conditions. It is additionally applied to kill pinworms. The plant is applied to increase appetite, reduce colic and treat diarrhea. Of the digestive disorders it is also applied for constipation, and digestive catarrh. It may relieve bronchitis and emphysema. It may be used for long-term hypotension as well. Its properties are very much like to garlic. Additional Info: Bear’s garlic belongs to perennials, and can be found in shady place, woody areas, where it grows in groups. The rootstock looks like an onion, which releases two lanceolate leaves. 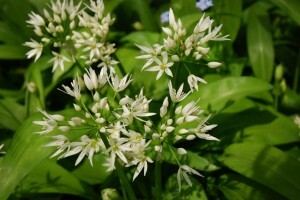 The plant blossoms in mid-spring to summer, when white flowers, smelling like garlic, appear. The seeds are distributed by ants. Preparation and Intake: Fresh leaves are applied in soups, or salads. Bulb is also used in dry form.